Love. It Makes a Difference • Run Hard. Rest Well. Love, some say, is spelled time. I think it sometimes is. This fall I came across a story I knew I wanted to share this February as we prepare for Valentine’s Day. I found it in Greg Finke’s book Joining Jesus on His Mission. This book was THE find of my 2015. I’ve been looking for it for 15 years! It clearly and powerfully shares the “Run Hard” of RHRW. It is a must-read. Check it out here or on Amazon. You will never be the same. A pastor and his family, living in Chicago, recognized and embraced the fact they were American missionaries. They found great joy in the relationships they built with their neighbors, except for one family. Knowing that “dad” was a pastor, they outwardly resisted. Years of attempts yielded no real connection until one Saturday morning when a knock came at the door. With no real word of explanation, Sam entered their house and sat down at their kitchen table. Pete, there was not a dry eye in the room. That boy was your son, Ben. I’m here this morning to say hi. I’m looking forward to getting to know you. And with that, Sam got up and left. Their friendship took off. Love, some say, is spelled time. 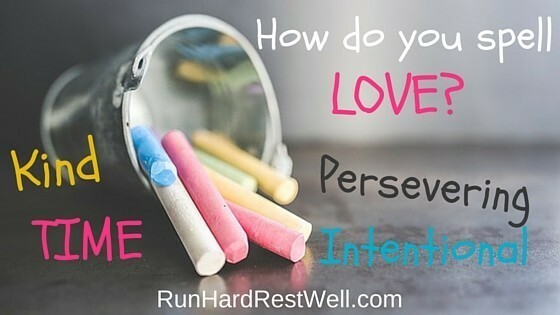 Others might add that it is spelled intentional, kind, persevering. As we go about our days, let’s wake up and look out. Every day we come across people who are marginalized –the last, the least, the lost, and the lonely. Some we see every day. Others we might come across while standing in line at the grocery store. Start with a smile. Let the Spirit lead the way. Powerful. Yes! I find in giving the smile, the hug, the attention, my feelings of isolation, loneliness, pain ease. I no longer look for the next person who will meet my needs when I reach out to someone else. It’s not easy. I don’t do it well. But it matters. Let Christ shine through you and His life will fill you. Amen. Amen. Amen !!! May we all be lights this month. This year! Love this Brenda! I also LOVE then new look of the site. It is beautiful! Stacey — Thank you! Means a lot. God is assembling a gifted team to get the message out. He’s been doing that through the centuries, too. An army of love!